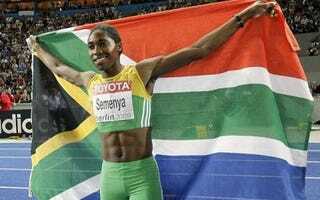 Semenya was cleared to return to competition by track's governing body today, even as questions remain regarding her gender. Here's what happened. It's been nearly a year since Semenya was suspended after dominating the competition at Worlds. Because of rumors that had long dogged her, combined with almost unheard-of improvements in her personal times, they forced her to undergo gender testing. That was way back in August, and only now do we receive a terse statement that she's free to run again. That, and nothing more. We should point out that the IAAF is possibly worse than FIFA when it comes to a culture of secrecy. Their rules are ambiguous as to what exactly constitutes "gender." They have neglected to clarify exactly what tests were run on her. And, in today's announcement, they refuse to make public the outcome of her tests. But she's allowed to run again, which means one of two things. • The genetic testing confirmed she is female, by the IAAF's nebulous standards. This goes against the sensational news story in September, claiming she was unequivocally male. But that same report stated that IAAF would permanently bar her form competition, so we can discount the rest of it. •She is now female by the IAAF's standards, due to a combination of a surgical procedure and hormone therapy. If there was uncertainty to Semenya's gender, it wasn't something that couldn't be altered by modern medicine. There's speculation that she's been able to regulate her hormone levels to an acceptable proportion for her to compete as a female. The length of such a process would explain why her suspension lasted so long. We'll never know, of course. The IAAF won't release the results of their investigation (as they shouldn't, if it would be an invasion of privacy.) Semenya will continue to carry a stigma, but that's not really her problem. She's free to run again, and that's likely all she cares about.